Let’s ring in the New Year 2018 with a review of research from 2017 focused on delirium prevention. Often, when I talk to others about the confusion and distress experienced by patients in the hospital, people share stories about their close friend, relative, or co-worker who experienced similar distress while hospitalized. Indeed, delirium has touched many lives. Amazingly, one in two cases of delirium can be prevented through early mobilization, cognitive stimulation, sleep hygiene, addressing sensory impairments and ensuring proper hydration and nutrition.1 Delirium is important to prevent because of its associations with hospital complications such as falls, aspiration pneumonia, an increased risk of mortality and an inability to return home following a hospital stay2,3. So, here are the 2017 prevention-focused studies from PubMed. 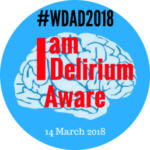 And don’t forget World Delirium Awareness Day is March 14th, 2018! Multicomponent non-pharmacological approaches are best implemented using a multidisciplinary team.11 It may be advantageous for future research, especially implementation studies, to explore the use of ancillary staff such as nursing assistants, sitters, OT, PT, volunteers and family to bolster delirium prevention. Nurses are well-positioned to coordinate and optimize ancillary personnel assistance with delirium prevention. Delirium science has made progress in 2017 towards preventing delirium using non-pharmacologic approaches and a multidisciplinary approach. 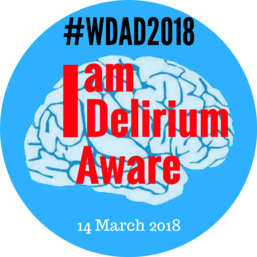 Help us spread the word of this great progress on World Delirium Awareness Day, #WDAD2018, March 14th, 2018. I cannot wait to see what new advances in delirium science 2018 has in store! Hshieh TT, Yue J, Oh E, et al. Effectiveness of Multicomponent Nonpharmacological Delirium Interventions: A Meta-analysis. In: Jama Intern Med. ; 2015. Posted in NIDUS Blog and tagged Delirium, delirium research.